Insert the key into the ignition lock cylinder and turn the key to the RUN position. Push a pick-type tool into the access hole (2) in the ignition and start switch housing and press the ignition lock cylinder lock tab down. 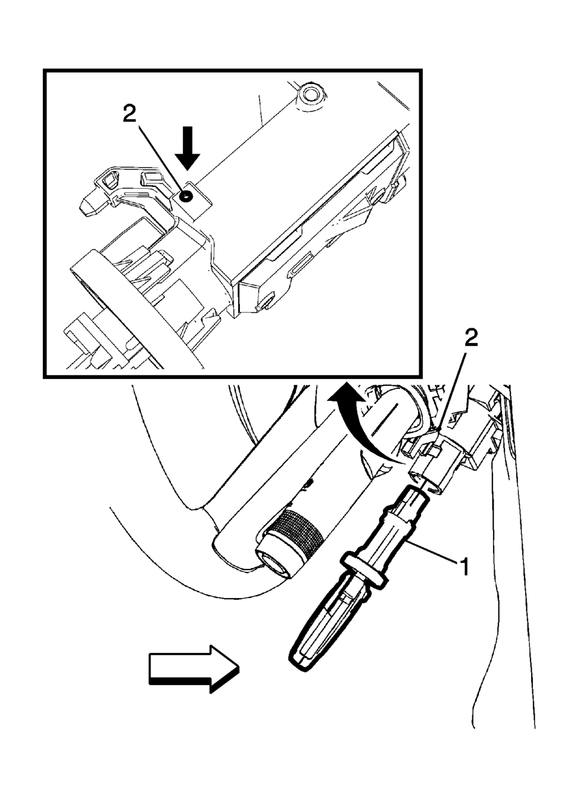 Remove the ignition lock cylinder (1) from the ignition and start switch housing. If you are installing a new ignition lock cylinder, code the lock cylinder. Refer to Lock Cylinder Coding - Ignition. Turn the key to the RUN position and insert ignition lock cylinder (1) into the ignition and start switch housing. Turn the key to the LOCK position and remove the key from the ignition lock cylinder.